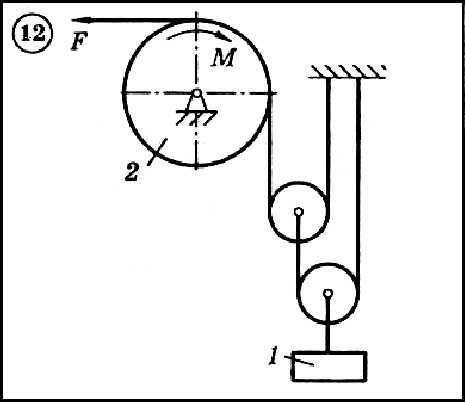 For the diagram shown in the figure using the Lagrange principle, determine the force F (in the presence of friction - the maximum value of this value), at which the mechanical system will be in equilibrium. Initial data: weight of the load G = 20 kN, torque M = 1 kNm, radius of the drum R2 = 0.4 m (in the double drum there is also r2 = 0.2 m), angle α = 300 and slip coefficient f = 0.5 . Unmatched blocks and skating rinks are considered weightless. Friction on the axes of the drum and blocks is neglected.